It was a random Tuesday night and a girlfriend of mine was getting off work. One of her favorite bands was playing at Ned Kelly's later and she wanted me to come with. Keep in mind it was, like barely 7PM and the band, Rikki Bobby wasn't scheduled to play until closer to 10 or 11ish. I had an early morning the next day and I was sure I would turn into a pumpkin by then, but I tried anyway. Ned Kelly's is located downtown on Washington Street, in between Cherry and Pine. When you first walk in, it looks like the bar is enclosed in a narrow rectangular space, but once you're further inside you see another room containing darts, foosball and a pool table. The main room with the bar has a stage area up front where Rikki Bobby and friends could most certainly jam out in. Their special for that night was $2 single rail mixers and 2 for 1 tap beer. And if you're thinking, big deal, two beers for the price of one – think again. Ned Kelly's has a really nice selection of draught beer. 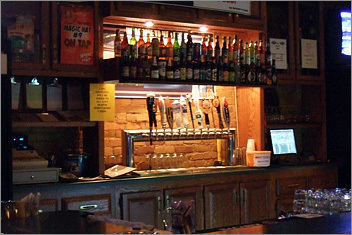 They have Fat Tire, Ranger, Guinness, Coors Light, PBR, Blue Moon, Miller Lite, Spotted Cow, Hefe Weizen and Magic Hat #9. I haven't seen Magic Hat since my days in Chicago. In bottles they have even more of a selection: Sapporo, Shiner Bock, Peroni, Harp, Beck, Stella, Mike's Hard Lemonade (does anyone really drink that stuff? ), Amstel Light, your standard Bud and Miller products and 312. I also haven't seen 312 since I left Chicago. And, no it's not 3-12, its 3-1-2. Like the area code. People in Chicago would always ask for a 3-12; I know I'm not the brightest but, come on, really? My smarty pants packer people wouldn't do that ;) I ordered the special, a vodka soda, and she ordered a Ranger. The total came to $8.75. That means either the beer is super pricey or there was some sort of miscommunication... I could've said something but I let it go, just be careful when you order. Also, keep in mind that they do take credit cards but there must be at least a $10 minimum. Low on cash but don't want to spend more than 10 bucks? There is an ATM located inside for your convenience. Looking around Ned Kelly's, I noticed how cute it looked. The bartender had lit up candles on top the bar and the lights were low. With the exposed brick walls and laid back atmosphere in the air, the place exuded coziness. My girlfriend said that they tend the change the atmosphere depending on that night's shenanigans or lack there of. Well, it most definitely seemed like the perfect setting for a more intimate jam session. But I suppose I will have to find out next time if that's true. I'm lame and was half turning into a pumpkin before the band started their first tune. Next time Rikki Bobby and Ned Kelly's! !